As one of the pioneers in female collegiate a cappella, Divisi, from the University of Oregon is known in many circles for their award-winning music, style and as being one of the top aca groups in the country. 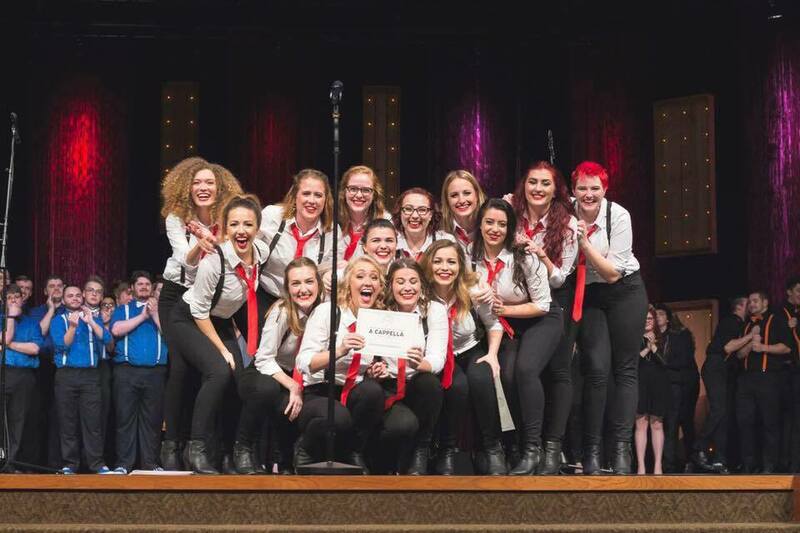 When it comes to Divisi, the 2016 Northwest ICCA Champions, the group is not a stranger to pushing the boundaries to deliver top-notch music, and doing it in their signature red ties. We caught up with the ladies from the UO campus to discuss the group's beginnings, their recent success, and a few details about what the group is like away from the music. COLLEGE ACA: Tell me about the group's founding. When did the group begin? Any specific influences that you all can point to that inspired your style? Divisi was co-founded in 2001 by YouTube sensation Evynne Hollens. During our 15 year existence, Divisi has traveled all over the country, from Portland to LA to NYC, competing, touring and performing. Divisi is all about representing strong women and having fun while making beautiful music with friends. We are known for breaking boundaries around the idea of what female a cappella "should" look and sound like. Our group is funded by the ASUO (Associated Students of the University of Oregon), in other words our student government. As a university recognized student organization, the ASUO generously awards us a budget to work with each school year. We also get hired to sing at various events in the Eugene, OR community and we deposit our payments in to our ASUO account to be used throughout the school year for our expenses. Well, Divisi is Italian for "divided parts in harmony" but we were originally called "8 Ladies and a Bow tie". Interestingly enough, we were a co-ed group when we were first founded and our only male member (the bow tie) was our vocal percussionist. Shortly after Divisi became an organized group, we realized that women can beat box too and that we did not need a man to do it for us. So, that is exactly what we did. We then became an all-female group and our founders chose the new name of Divisi to represent the fact that our differences as individuals were brought together in harmony through our love of music. Many involved in the college a cappella scene are familiar with Divisi as being one of the top female, and in general, a cappella groups in the country. What's it like having this sort of label? Has it had any effect on group standards, the way you run things internally, or even just a general perspective from members? Absolutely! We are so honored to be recognized as such in the a cappella community. Every time we meet people who are familiar with our group and its history, we are incredibly humbled. We hold our group members to very high standards in every aspect of the term. Our audition process is extensive and purposefully difficult for auditionees. As a Divisi member, you are expected to not only be a determined and proficient singer, but also to be a dedicated musician who knows how to learn and interpret music in a skillful way. We work hard to uphold a long legacy of strong, female singers. Each member is important and we try to make sure that each person has a leadership role within the group, as we are completely student run. We view ourselves as representatives of the University of Oregon and also as representatives for young singers across the globe. Currently, what are the top 3 shows that the group is watching on Netflix? Ah, only three?! Hmm...Parks and Rec, Sons of Anarchy and Scandal. What are some of the activities Divisi likes to get involved in when they aren't rehearsing or performing? What do you all do for fun? student would do, you can find Divisi members doing it together. Do you have any crazy/funny/interesting stories from group road trips, performances, or rehearsals? Here's a crazy thing that happened to us during our trip to New York City for the ICCA Finals in April. Two of our members got stuck in the elevator at the Beacon Hotel with about 10 other people, a few of which were guys who sing in The TechTonics. This happened right before call time for the show to begin and we were stuck in the elevator for almost a half hour. In fact, the people who organize ICCA Finals almost had to switch up the show order for the competition, as The Techtonics were scheduled to perform first in the lineup. Thankfully, we all got out safely (despite getting stuck in an elevator being the worst fear of one of the members that got stuck in there) and the show was miraculously able to run as planned! a) what's on my to-do list before the show? b) what local spot are we dining at after the show? where the hand make their noodles and everything else. It is simply delicious. Afterwards, we would have to stop by our favorite local dessert shop, Sweet Life! Feeling Myself by Beyonce, 100%! When that song comes on you can probably find us dancing (most of us dancing not very well) and screaming the lyrics rather than singing them because we all love the song so much! We actually used this song to get us pumped up before every competition this past year. It gets us in the zone of feeling confident, fierce, and ready to take on the world by storm. But we would probably never, ever perform it at an event. Any big plans for the coming school year? A new album, more competitions, Fall concert tour,etc.? Lots of exciting things are in the works! We are currently working on producing an EP Album to be released in the Fall. We plan to attend the SheSings Festival in Berkeley and possibly LAAF (Los Angeles A Cappella Festival), along with BostonSings. Additionally, we have discussed touring in the Spring and have been working on ways to make that possible. Anything else you'd like for our audience to know about the group? The 2015-2016 school year has been absolutely amazing for us. We are so thankful for all of the opportunities that have come our way and we are proud that we were able to compete at ICCA finals. The support we received from people all over the nation and the globe has been overwhelming and so appreciated. We are extremely fortunate to have had the chance to share our message on such a prestigious stage and to have been able to compete in honor of the Divisi alum who have worked so hard to make this group what it is over the past 15 years. Be sure to check Divisi out on their website, Facebook, Twitter, and YouTube.